Farmers and their families in Malawi have been hard hit by unpredictable and less than expected rainfall amounts. The drought, caused by a particularly powerful El Niño event, has left many in need of food assistance. In Malawi, Balaka is one of the districts hardest hit by the crisis and has experienced significant decreases in crop production. Food access is restricted due to high prices and limited income generating opportunities for many in the region. Because of drought-induced crop failure, families are being forced to cope by selling off valuable assets, like livestock and household items, and reducing the number and size of meals that they eat. 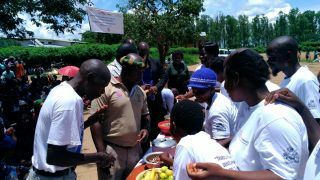 In response, PWS&D—with Canadian Foodgrains Bank—is providing emergency food to 3,470 households in Malawi over a five-month period. The $762,000 project is also receiving financial support from The United Church of Canada. 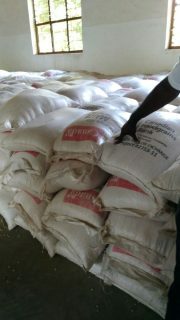 Food distributions consist of maize, pulses, a corn soya blend and cooking oil. Targeted beneficiaries of the project include children, pregnant and lactating mothers, the elderly and people with disabilities. Nutrition awareness training is part of the food distribution project. Nutrition education through demonstrations, dramas and performances will take place before each distribution to raise awareness and understanding of nutrition and feeding practices for infants and young children, pregnant and lactating mothers, and the chronically ill. Recipes and menus have been developed and cooking demonstrations will take place at distributions as well. You can make a donation to PWS&D’s drought response through your church, by mailing a cheque to the office, donating online, or calling 1-800-619-7301 x291. Please give today.